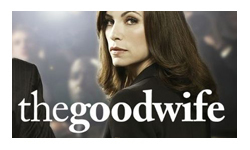 I have this idea that there’s a big whiteboard in the writers room of The Good Wife. For the first season it had the word ‘Balance’ at the top followed by a list of all the different fragile balances that were being maintained by the characters – Alicia’s balance between what her family needs and what she wants, Will’s balance between his playfulness and his pride, Carey and Alicia’s balance between sibling like support and professional competition. The writers would look at that board and every plot, every relationship, every moment came from there. The beauty of season 1 was that they managed to do that so subtly that you didn’t realise that it was being written, it all felt perfectly natural and consistent. Then off the back of their spectacularly successful first season they crossed out balance and wrote ‘Conflict’, then they took each of those balances and poked them, upsetting the equilibriums and pushing the characters and their relationships to breaking point. But the subtlety of season 1 was nowhere to be found, the poking was blatant and artificial, leaving me as a viewer feeling manipulated and unhappily reminded that the writers exist and this is a television show. Take Kalinda. In season 1 she was walking an interesting line between trying to cling to her privacy while forming an interesting bond with Alicia. This season her privacy was poked at relentlessly by a film-noir-esque cheesy rival until she had some sort of psychotic break and went completely mental. When it was eventually revealed that the big secret was that she slept with Peter, I greeted it with “didn’t we kind of know that already?”. It just seemed so utterly melodramatic and over the top that by the time the reveal was made, anything short of murder seemed disproportionate to the amount of fuss of covering it up. The conflict between Will and Diane felt equally artificial, the beautiful balancing act from the first season casually thrown away in favour of childish rumour mongering. Likewise I didn’t care about any of Peter’s political manoeuvrings to become State’s Attorney, it all just ended up with me hating all politicians and wondering why anyone would want the job that badly when it seemed to be a miserable job. That’s not to say the show is bad, it’s still miles better than most other stuff on television, and certainly in a different league from most of the other procedurals. The cases are still interesting and engaging on an emotional level, feeling like they’re about real people, a great contrast to the instantly forgettable and disposable plots other procedurals like CSI wheel out each week. I also continue to love the supporting characters like Eli Gold, it will be interesting to see him working alongside Alicia next season. I also hope to see more of Alicia’s brother, he brings out another side of Alicia, one that has fun and is silly and open. This is still a great show, I think the writers just made a few miss-steps with the more drawn out plot elements, maybe scared that people would expect a second season to be bigger than the first. Hopefully when they come to look at their white board they’ll chose to head it up with something like ‘Rebalance’ and realise that when you’re THIS good, you really don’t have to try so hard.